Public gardens have been carpeted in an array of deep red and yellow leaves, thanks to the year's unusual weather. 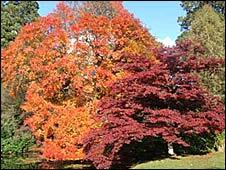 Tony Kirkham, head of arboretum at the Royal Botanical Gardens, said the wet summer provided good growing conditions for the trees. He said: "In September, we had some cold temperatures in the evening and warm, sunny days. "The mild frost acts as an early warning to the trees to shut down for winter, so they can take some of the goodness out of the leaves and you get the good colours. 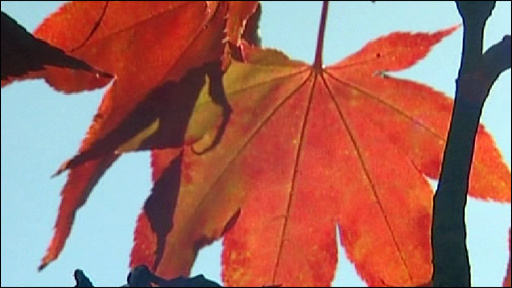 "If you get a long frost, they don't get a chance to do that and the leaves fall quickly." "We have a real variety of trees in Kew, so you get a rainbow of colours but we seem to be getting good autumn colour all over the country."